WP Super Cache Review 2019: Is It the Best WordPress Caching Plugin? Home » Plugins » WP Super Cache Review 2019: Is It the Best WordPress Caching Plugin? Are you looking for a caching plugin for your WordPress website? WP Super Cache is a popular free caching plugin for WordPress users. In this WP Super Cache review, we will take a look at its performance and features. We will also compare it with other popular caching plugins. What Makes a WordPress Caching Plugin Great? There are several great plugins to serve cached pages on your WordPress site. Many top WordPress hosting companies offer built-in caching solutions with their managed WordPress hosting. If you are on a managed host like WP Engine, then you don’t need to install a caching plugin. On the other hand, if you are on a shared host, like BlueHost, then you need to install a caching plugin for your WordPress site. A caching plugin needs to generate cached version of pages without taking too much of your server resources. Most caching plugins generate a cached file when a page is requested for the first time. After that they keep those files stored for a pre-defined duration. It also needs to work well with your WordPress theme, plugins, and any third-party services you may be using. 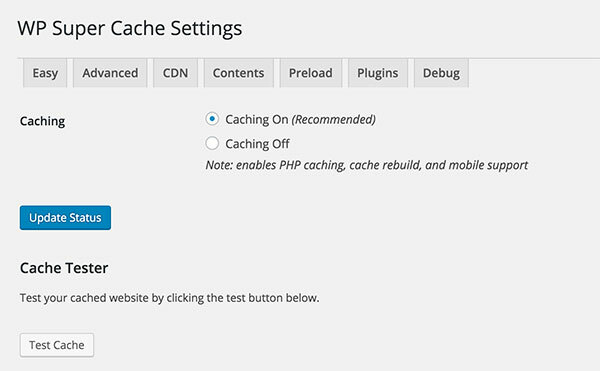 Caching is an advanced process, a plugin needs to make it easier even for non-technical users. The options can be extensive but they need to be presented with clear user interface and lots of explanation. Having said that, let’s take a look at WP Super Cache and how it works. First thing you need to do is install and activate the plugin. Upon activation, simply go to Settings » WP Super Cache page to setup the plugin. Select ‘Caching On’ option and then click on update status button. WP Super Cache will turn on caching. You can now click on test cache button to check if it is working. WP Super Cache will fetch your WordPress site twice and will compare the timestamps of both pages. If the both timestamps match, then this means that caching is working on your site now. Take a look at this guide on how to install and setup WP Super Cache for detailed instructions. WP Super Cache can serve cached files using two methods. The default method uses PHP, which can be resource intensive particularly on shared hosting environments. If you are on a shared host, then we recommend you to try using mod_rewrite. Simply click on the Advanced tab in plugin settings and select ‘Use mod_rewrite to serve cache files’ option. If you test your website using Google Page Speed tool, you will notice that it recommends you to turn on compression. Using compression your web server can send users compressed files. These compressed files are then extracted by user’s browser and displayed on screen. It increased your response time and improves your overall page speed. WP Super Cache does not turn on compression by default. You will need to enable it by visiting Advanced tab under plugin settings. Simply check the option that says ‘Compress pages so they’re served more quickly to visitors’. WP Super Cache works nicely with CDN. 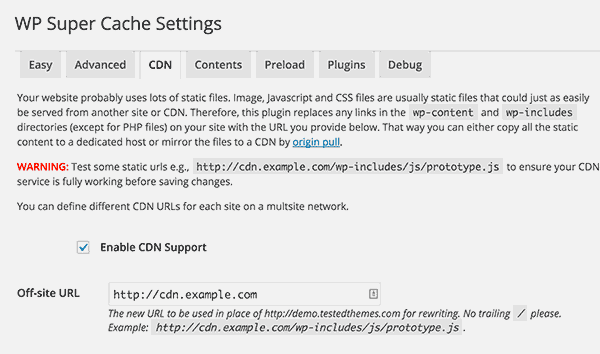 Simply click on the CDN tab under plugin settings and add your CDN URL. You can also add additional CNAMEs to improve performance. See this guide on why you need a CDN for your WordPress blog for more information. We recommend using MaxCDN which is one of the largest CDN service. We use it on all our websites and it helps us boost page speed. WP Super Cache and W3 Total Cache are the two most popular caching plugins for WordPress. They both have huge user base who would passionately defend their favorite plugin. Both plugins offer similar features. They both have slightly difficult setups, but WP Super Cache has simplified their user interface a lot. Both plugins are available for free with limited support. However, WordPress sites are hosted on many different kind of platforms. 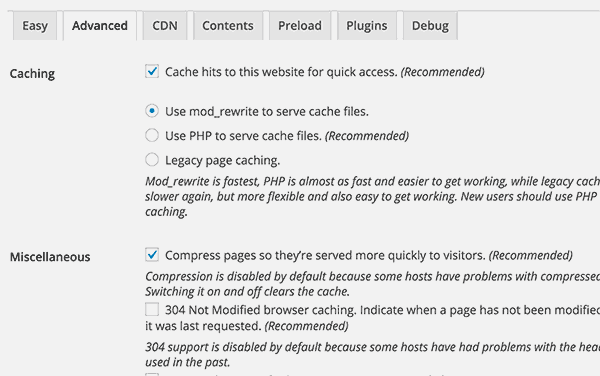 Performance of your caching plugin may vary depending on your hosting environment and your WordPress setup. You can also run your own speed tests after setting up both plugins to see which one makes your site faster. We use W3 Total Cache on all our websites and have often found it faster than WP Super Cache. We believe that WP Super Cache is a highly useful WordPress plugin. It performs a complicated job for thousands of WordPress websites around the world. It may look a little intimidating due to complex setup options and technical language used in setup instructions. However, with proper guidance you can set it up with in minutes. Community support is available through WordPress support forums but it is limited and not guaranteed. If you liked this article, then please consider following us on Twitter and Facebook. If you have any questions, please let us know by leaving a comment below.